Rio de Janeiro ("River of January") is the capital city of the State of Rio de Janeiro, the second largest city of Brazil, and the third largest metropolitan area and agglomeration in South America. The city was the capital of Brazil for nearly two centuries, from 1763 to 1822 during the Portuguese colonial era, and from 1822 to 1960 as an independent nation. It is also the former capital of the Portuguese Empire (1808 - 1821). 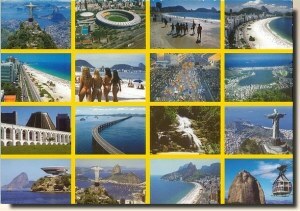 Commonly known as just Rio, the city is also nicknamed A Cidade Maravilhosa, or "The Marvelous City".